DC's Trinity… by Jim Lee! 7-inch scale statues of Wonder Woman, Batman, and Superman. Iconic designs from a legend in the comics industry. Jim Lee, one of the icons of the industry, presents the Trinity of the DC Universe in one remarkable 3-pack of statues! 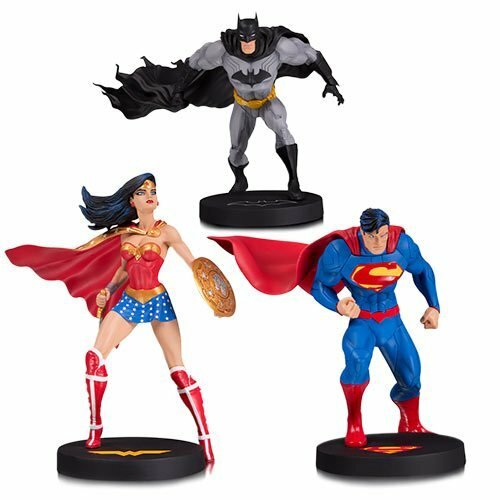 These 7-inch scale DC Designer Series statues feature the big three - Wonder Woman, Batman, and Superman - together in some of the most iconic designs from comics legend Jim Lee. Made of polyresin, Wonder Woman, Batman, and Superman measure about 5 4/5-inches, 5 1/2-inches, and 6 1/4-inches tall, respectively. And you get all three!